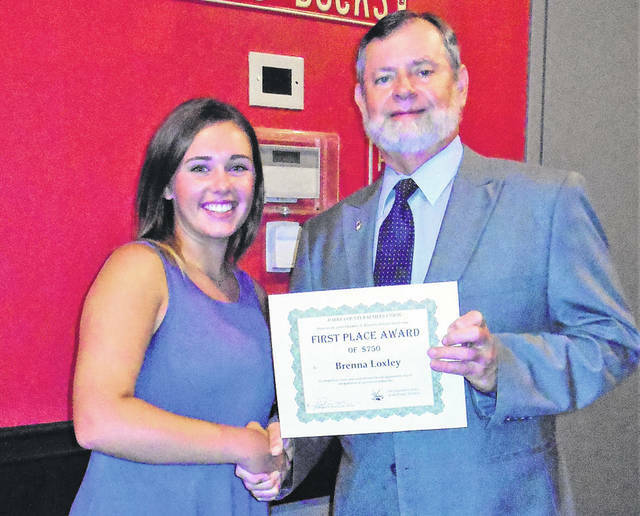 Brenna Loxley, first-place winner of the Theodore L. Finnarn Scholarship award is pictured with Theodore O. Finnarn, son of Theodore L. Finnarn and Secretary-Treasurer of the Darke County Farmers Union. GREENVILLE — The Darke County Farmers Union has announced the winner of its 2018 Scholarship Essay Contest. This year’s first-place winner is Brenna Loxley, daughter of Katrina (Craig) Unger and Shawn Loxley, and granddaughter of Jed and Penny Smith. Brenna is attending The Ohio State University and majoring in Agri-Science Education. This year’s Darke County Farmers Union Scholarship Essay Contest was a tribute to an active, lifetime member of the Farmers Union, Theodore L. Finnarn, who passed away on February 8, 2003, Mr. Finnarn had served as President and on the Executive Committee of the local Darke County Farmers Union. He was engaged in farming with his father and son, and the business was known as “Finnarn Farms,” located in Neave and Butler townships in Darke County. He maintained a herd of registered Shorthorn and Hereford cattle. Mr. Finnarn was very active in farm policy matters and was a member of the Darke, Ohio and National Farmers Union, attending many state and national conventions and participating in several lobbying trips to Washington D.C. to promote the rights and interests of family farmers. He was appointed by the late President John F. Kennedy to a special Feed Grains Council in the early 1960s which helped to develop the federal feed and grain farm programs of the 1960s and 1970s which served thousands of farmers. He also served as the local ASCS committeeman and on the local Darke County Planning Commission. In addition, he founded a Blue Cross-Blue Shield health insurance co-op with the Darke County Farmers Union in the late 1950s, which lasted for over 50 years. Darke County high school seniors or college freshman who have a membership in the Farmers Union (or have parents or grandparents who are members) are eligible to compete in the local county chapter’s essay contests.